See below for Andrew's chilling first-hand account of the earthquake and avalanche at Mt. Everest Base Camp and the extraordinary efforts that followed. A 7.9 earthquake struck Nepal on Saturday, killing thousands in Katmandu, causing severe damage to many villages in the Khumbu Valley and triggering a massive avalanche that obliterated about one-third of Everest Base Camp. As of today (Monday), all of our IMG expedition team is safe and accounted for. 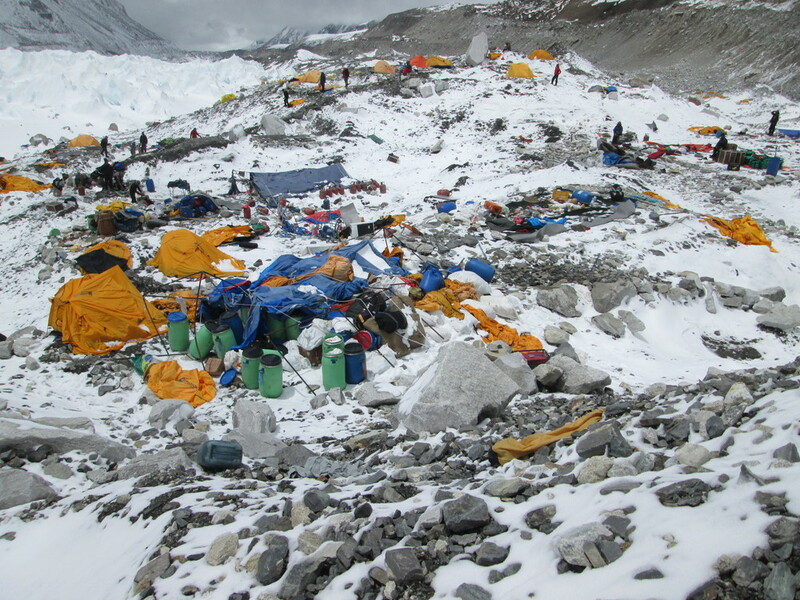 Unfortunately, the death toll across base camp appears to be more than 15 and climbing. Our endeavor to reach the summit has been officially called off, considering the damage to i) base camp, ii) the Sherpa community in the villages up and down the Khumbu, and iii) the route up Mt. Everest. We will begin trekking back down the valley sometime in the next few days and I hope to arrive back in Philadelphia in time to graduate from Penn on May 17th. The international aid effort has been impressive, which I think reflects a growing empathy for the victims of foreign disasters. By promoting intercultural exchange through Youth For Understanding (YFU), hopefully such international awareness and care will only continue to grow. Thank you all for your support and concern, and in particular to Scheels Sports, Casual Adventure, Happy Harry’s and Ag Warehouse for your terrific support of YFU. The last 49 hours felt like a week. First, there was the avalanche. Felt like I was sitting on the edge of a large trampoline as somebody else jumped on the middle. It was disconcerting when something I have taken as stable my whole life begins to move underneath you. It made me realize how much I take for granted, like stability in the very ground that we live on and build on. My first reaction to the earthquake was fear that it might destabilize the glacier under our feet—that a mighty crevasse might open up underneath us. Very quickly, though, the threat from above became clear. We heard rumblings above us in all directions, and when I looked, I saw only a wall of snow ~ a quarter mile high rushing toward us from the north. In retrospect, this may have been the plume created after the real thrust of the avalanche had already hit central base camp. At any rate, I did not know where to go, but I figured I wanted to be able to see the hell that was about to rain down on me, and so I stayed outside. I thought about the likelihood that the plume might carry rock and ice chunks, and so I assumed the fetal position behind a medium sized boulder, hoping it might act as a shield from any flying debris. I put my elbows by my sides and my fists against my forehead, hoping that I might create an air pocket, should a blast of snow cover me. I was breathing hard, waiting for it to really come down hard before taking one monster gasp before I was buried. In retrospect, putting my face in my jacket might have 1) reduced the likelihood that my mouth and nose filled with snow and 2) increased the likelihood that I would have an air bubble to breath. Live and learn. When I stood up, I had about 3 inches of snow on me but nothing more. I was lucky. Our expedition leader quickly confirmed that all of our International Mountain Guides (IMG) team was accounted for, and the next thing I heard was a discussion between him and Himex about which would serve as the most logical hospital, since the Himalaya Rescue Association (HRA) hospital had been destroyed. They agreed that IMG was easier to access, and we began to clear our communications tent and our dining tents for casualties. Within an hour, they started to pour in--some walking, most being carried. The first role I assumed was that of a traffic cop, helping to direct casualties to the right tent. Soon, the doctors were in search of supplies to use in treating the patients, bedding them, and keeping them warm. I helped collect Nalgene water bottles for use as hot water bottles that patients could clutch, and I led a group of people to neighboring camps to find more sleeping bags and foam mattresses, after we had donated our own. More camps and their doctors arrived, and soon there were multiple large medical kits. Once we were sure there were enough sleeping bags, pads and warm water bottles to go around, I started looking for ways to be helpful inside the patient tents. At first, this meant helping to distribute food, water and trash bags, but before I knew it a doctor asked for help setting a splint on a patient who had broken his femur. The next patient we helped had compound fractures in both of his legs; when we lifted up the sleeping bag covering him we saw both of his legs at right angles to where they should be when he was lying on his back. He received a heavy dose of pain medication and we wrapped both of his legs to two hiking poles, using sections of foam sleeping pad to insulate the legs from the poles and bandages. We moved to the next dining tent, where my first task was to help prevent a gentleman’s toes from developing frostbite. He had broken his pelvis, shattered the bones in his hand, and dislocated his elbow, and the bandages around his legs were so tight that his feet had gone numb despite having dry socks and a heavy sleeping bag around them. He was grateful for the foot massage and hot water bag I gave him and was surprisingly lucid and understanding, given his severe injuries. The final gentleman I helped had an 8cm cut across his forehead which went down to the bone, and my responsibility was to help clean up his face after the doctors had bandaged his gash. He, too, was remarkably kind and even maintained a sense of humor as I cleaned his face. He kept saying in broken English “I look good, yeah?” He even fell asleep with a smile on his face. By the time I was done cleaning him, the doctors had finished their second sweep of that tent, so we cleaned up and made sure the patients had everything they needed for the night. By this time it was approaching midnight—the earthquake had struck just over 11 hours earlier. The doctors suggested there was nothing more we could do until the sun came up and helicopters began the medevac, so I went to sleep after checking in one last time in the head trauma tent. My Sherpa climbing partner lost a cousin in the avalanche and had a nephew with a serious head trauma. He had no idea how his small village in the next valley had fared in the earthquake and he was quite distraught. I awoke at 6:00 am to the sound of the first helicopter, and remarkably, no additional patients had died during the night. By 6:15 I was helping move patients to the helipad. This required a bit of coordination, as there weren’t enough stretchers to go around and one doctor was keeping a master list of patients in rough order of urgency of evacuation. I felt useful going between the four tents, finding the specific patients who needed to be prepped for each subsequent helicopter and helping to move them to the landing pad we had built at the edge of our camp. By late morning, all of the casualties had been transported to the next closest Himalaya Rescue Association hospital in Pheriche, and within a couple of hours we learned that an MI-17 chopper had carried them all safely to Katmandu. This was good news, because the earthquake had knocked down one of the walls of the Pheriche hospital and they were not equipped to handle the 25-40 patients that had come their way. With the injured evacuated, we began to clean camp. Within an hour, there was a 20’ area outside of the head trauma tent littered with blood soaked sleeping bags, water bottles and soiled clothing and bandages. I helped sanitize our dining tents, first sweeping them and scrubbing the floor mats, then disinfecting the tent walls. By noon, the camp was beginning to look like normal, except for the piles of debris and the large stockpiles of medical equipment. While all of this was happening, one of our IMG guides and a team of Sherpas went into the icefall to check its condition—to see if the climbers at Camp I and Camp II had a chance of climbing down on their own. A number of ladders had fallen down and the camp of the “Ice Doctors”—the elite team of Sherpas who create the route through the icefall each year—had been destroyed, so the conversation quickly turned to helicopter evac of Camps I and II. Located at ~20,000’ and ~21,000’, Camps I and II require incredibly talented helicopter pilots to access. Almost exactly 24 hours after the initial earthquake, we got the first major aftershock, measuring 6.7 on the Richter scale. As before, we had just sat down for lunch in our newly cleaned dining tent, and as before, we all ran outside to watch for avalanches. It was much cloudier that afternoon, and so we could hear new avalanches coming, but couldn’t see them. Finally, we saw the tail of one running down the Khumbu Icefall from the direction of Camp I. This second earthquake had little impact on base camp, but we later learned that it worsened the condition of the icefall and badly damaged the village of Pangboche about half way down the Khumbu Valley. We heard the second earthquake was particularly terrifying for Camp I because they heard avalanches in all directions but couldn’t see anything. Luckily, no one on our team (and I believe no one on the mountain) was hurt by the second earthquake. Helicopters couldn’t fly the rest of the afternoon, so we relaxed a little bit and began to prepare for the following morning. If the clouds lifted, helicopters would attempt to bring down all of the climbers and Sherpa from Camp I and Camp II. At 6:00 am this morning, they began doing just that. After somewhere north of 50 helicopter sorties, each carrying 1-2 passengers without gear, we learned that everyone on the upper mountain had been brought down to safety. These evacuations didn’t require nearly as much base camp manpower as did loading the sick the previous day, and so a group of us hiked over to the Himalaya Rescue Association hospital to help them dig out the rest of their equipment. The wreckage around base camp was phenomenal. The first destroyed tent was about 100m from my tent, and by the time we had walked 200m from my tent we were in the epicenter of the destruction. As we dug out the hospital, we discovered tents buried by multiple boulders the size of mini-fridges, and we could only imagine the impact caused by such objects falling from thousands of feet above. We heard a story about one doctor who was standing next to someone watching an avalanche fall from the northeast when the much larger avalanche pummeled the two of them from the northwest. One doctor was left standing; the other was hit by a boulder and found over 400 meters away toward the middle of the glacier. By early afternoon, about 50 hours after the initial earthquake, all of the seriously injured had been medevacked and all climbers from the upper slopes of the mountain had been brought to safety. Finally, we could relax a little bit and digest what we had just been through. Our expedition leader brought us all together to announce that our expedition was officially over; the earthquake and avalanches had destroyed much of the route through the dangerous icefall and many of the Ice Doctors had either been killed in the avalanche or had left for home after their camp was annihilated. That, plus the risk of further aftershocks and avalanches and the need for many of our Sherpa teammates to go back to their villages to take care of the earthquake damage there, made the decision quite simple. Our team will spend Tuesday packing and hopes to begin the trek out of the Khumbu the following day, Wednesday. What will I remember from this tragedy? 2. The resilience and perseverance of the patients who remained calm and even expressed gratitude throughout our best attempts to treat them. 3. The willingness of everybody to pitch in—whether they were clients or guides or Sherpa, and whether they were helping by treating patients, keeping the stoves going, managing logistics, or donating their only sleeping bag to the victims. 4. The building international aid effort for the people of Nepal, and particularly the thousands killed, injured and suffering in Katmandu. I truly believe that international responses to tragedies like this get better as the world becomes smaller and people are better able to empathize with one another. And nothing builds cross-cultural understanding quite like teenage intercultural exchange. I could not be prouder to be here on behalf of Youth For Understanding (YFU), and I could not be more grateful for the support to YFU (Youth for Understanding (Andrew Towne) from so many, particularly Scheels Sports, Casual Adventure, Happy Harry’s, and Ag Warehouse. Read a follow-up article in the Grand Forks Herald here. We received the following email from Gary Towne, Andrew's father, after a 45 minute phone conversation he had with Andrew on Sunday. Andrew is well and uninjured, has spent the last 36 hours without sleep, helping to find and care for the injured and helping with MedEvac. All of the severely injured have now been evacuated by helicopter. 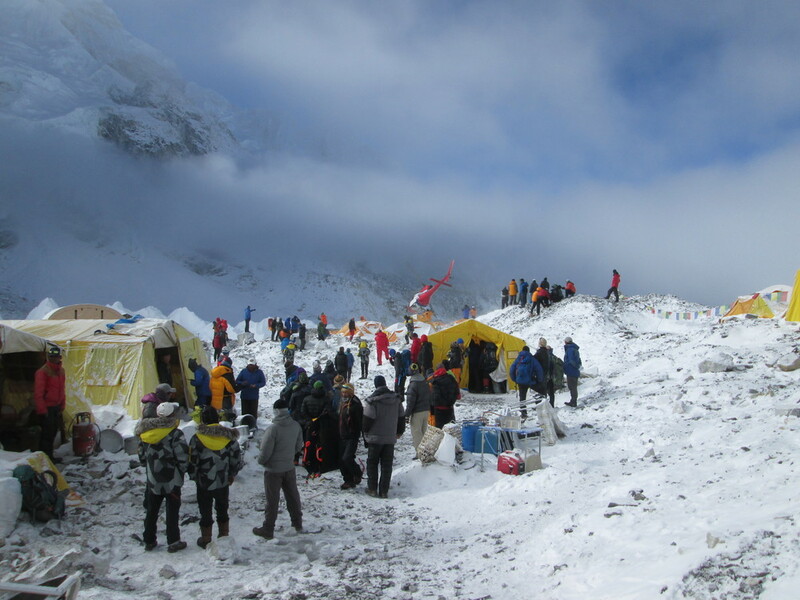 Several dozen people remain at Camps 1 (20,000 ft.) and 2 (21,000 ft.). It seems that these climbers experienced fewer if any injuries, none serious, but the situation is still not yet completely clear. Present concern is to determine the best way to help these people down the mountain. The altitude is near the limit for helicopters, so only 2 or 3 climbers can be evacuated on each trip. On the other hand, the ropes and ladders through the Khumbu Icefall (through which they must pass if descending on foot) have mostly been destroyed. Setting these ladders and ropes takes a large team of Sherpas at the beginning of each climbing season. There may not be that many left on the mountain; and, in any case, it appears that the icefall is very unstable, continuing to collapse, and is unsafe at this time. Andrew stressed that the tragedy is profound—for the Sherpa community in every village of the Khumbu valley and elsewhere, as well as the entire nation of Nepal—the worst natural disaster to afflict the country in historical memory. At the same time, he clarified that this year’s avalanche had a very different effect from last year’s. The 2014 avalanche affected only Sherpas, who were rigging the ropes and ladders, and who face much greater risks than visiting climbers. Each climbing season, a Sherpa may make 30 or more trips through the treacherous Khumbu Icefall, one of the most dangerous parts of the climb, because they do the rigging and repairing as described above as well as guiding the groups of visiting climbers. Each visiting climber, however, traverses the Icefall only about 6 times—it is part of altitude acclimatization hikes as well as the final push to the summit. This year’s (2015) avalanche was more diffuse in its effect. Not only was the total number of casualties substantially greater (exact figure not yet known), but the spread of those injured was indiscriminate. Both Sherpas and visiting climbers were killed or injured. Observers on site seem to agree that the source, location and path of this year’s avalanche were unprecedented and could not have been anticipated. The Khumbu valley ends in a cirque (French, or cwm, Welsh), a semicircular valley ground out of the mountain’s base by the root of a glacier. Last year’s avalanche fell from the east side of the cirque. This year’s avalanche fell mainly from an ice cliff in the saddle of Pumo Ri (and perhaps some other slopes) on the north and west. The falling masses of snow and rocks created a huge aerosol avalanche and accompanying air blast that came together at the bottom, and, blasting out through the most direct path, hit the upper part of Everest BC and blew many tents across the Khumbu Glacier towards the lower Icefall. (Adapted from the International Mountain Guide (IMG) web blog.) Most observers Andrew has spoken to feel that, in normal conditions, without the violent earthquake that dislodged the ice cliff, this avalanche would not have occurred. Chance, Fortune, or Providence played a major role in which parts of the camp were most affected. Some areas seem to have escaped nearly entirely due to positions farther from the Khumbu glacier or under a protective ridge. Andrew’s tent was only 100 meters (1 football field) from the edge of the devastation. 200 meters from his tent was squarely in the middle of the worst hit area. Even in severely hit areas, deaths were unpredictable. According to one report, a boulder crashed through a tent, drove a climber through the tent’s side and crushed him, while leaving two companions still in the tent relatively unscathed. For more frequent updates and an official perspective see the IMG blog. Andrew sent his deepest thanks for expressions of concern, support and prayers. He also wanted to make several points. 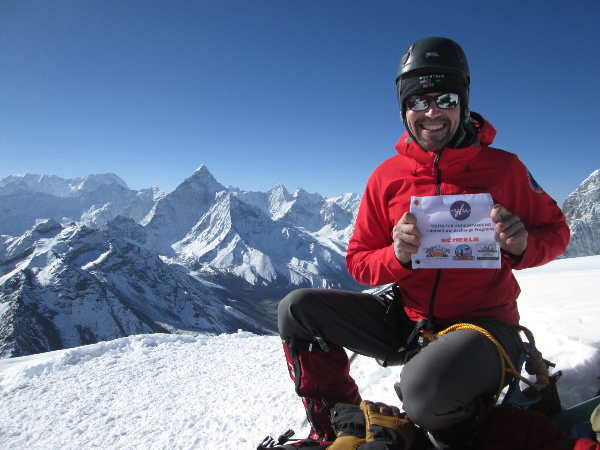 His Everest attempt has been a benefit in support of Youth for Understanding (YFU), an old and highly respected international exchange program with which Andrew went to Germany in his high school junior year and of which he is now a board member. He is paying his own way; all money contributed goes to YFU. In addition to many individual contributions, Andrew also received major corporate support as YFU Partners from Ag Warehouse of Finley, ND, Happy Harry’s Bottle Shops & Scheels Sporting Goods of Grand Forks, ND, and Casual Adventure Outfitters of Arlington, VA. Whether or not he is able to complete his climb, he feels an obligation to acknowledge their generous support. It is still possible to contribute to YFU. Bill Harwood, Grand Forks and UND graduate now retired from the State Department (and incidentally once stationed in Kathmandu), said of YFU, “When I worked for USIA, YFU was a major grantee organization. It had started back in the Eisenhower days, as I recall. During the next 50 years they got major contributions from corporations like Toyota. . . . Then [there was a] falling off of federal and private donations . . .” YFU remains a very worthy and venerable organization for fostering international understanding, worthy of generous support. That is also very true of the aid efforts for the Sherpas and Nepal in general. For anyone who wishes to contribute to the Sherpas, Support For Sherpas, a British group, seems to be responding to that specific need, while Mercy Corpsand Global Giving, both American groups, have opened efforts for all of Nepal. I’m sure there are others, but these were some I could find on short notice. All three have easy-to-navigate donation methods. After such an extended update, I expect that I will be winding down pending further major developments. If you wish frequent updates, check the IMG blog. See related article in Grand Forks Herald. 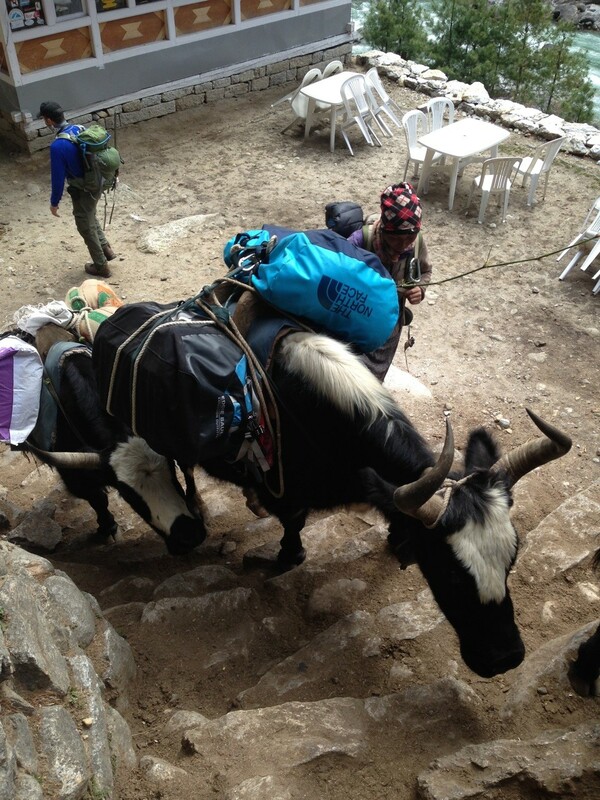 A moment of levity in a picture not all of you may have gotten—the yak with Andrew's gear ascending a "street" in Namche Bazaar. "Thanks for Andrew's update. I reread the article in The Lightand thought I'd correct a minor error. 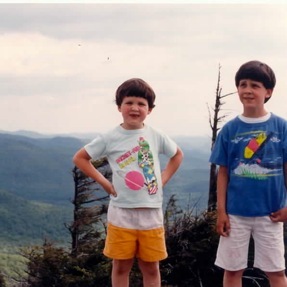 Andrew's FIRST summit was Mount Mansfield, Vermont's highest peak, at the age of 6 in 1988, just before we left Vermont for North Dakota. He is at the left in the picture. His brother Jonathan, 8, is on the right." We descended back down the valley to acclimatize at about 19,900’ on Lobuche Peak on April 19. We returned to base camp two days ago and are getting ready for our first venture into the Khumbu icefall on the 23rd. Our team is strong and morale is high. We were fortunate to receive Buddhist ‘puja’ blessings both at base camp and in Pangboche village with Lama Geshi, the spiritual leader of the Khumbu Valley. In the last two weeks, we finished the trek to the head of the Khumbu Valley--Everest Base Camp (~17,500’). Along the way, we visited Lama Geshi in Pangboche for a Buddhist puja blessing. Lama Geshi fled Tibet during the Chinese takeover and is considered the region’s spiritual leader. Before blessing our climb, Lama Geshi had an audience with a woman from a neighboring village, and seeing how significant it was to her to be able to meet with him made us even more grateful for his time. Lama Geshi encouraged us to “Give up all intentions to harm others from our heart and do our best to benefit them all. If each and everyone of us feels the Universal Responsibility to do so, we will all enjoy the feast of peace!” At 83 years old, Lama Geshi was spry and obviously delighted in everything he did, saw and felt. It was clear that he was at peace with us and his surroundings, and our team left with a larger worldview and sense of purpose. From Pangboche, we ascended past the tree line and spent a few nights in the town of Pheriche, ~14,500’. We climbed nearby ridges during the days and enjoyed sampa cake and yak stew in the evenings. I read The Boys in the Boat during our downtime, which brought back a flood of fond memories of college rowing. After camping for a few nights ~16,000’, we finished our trek to base camp. 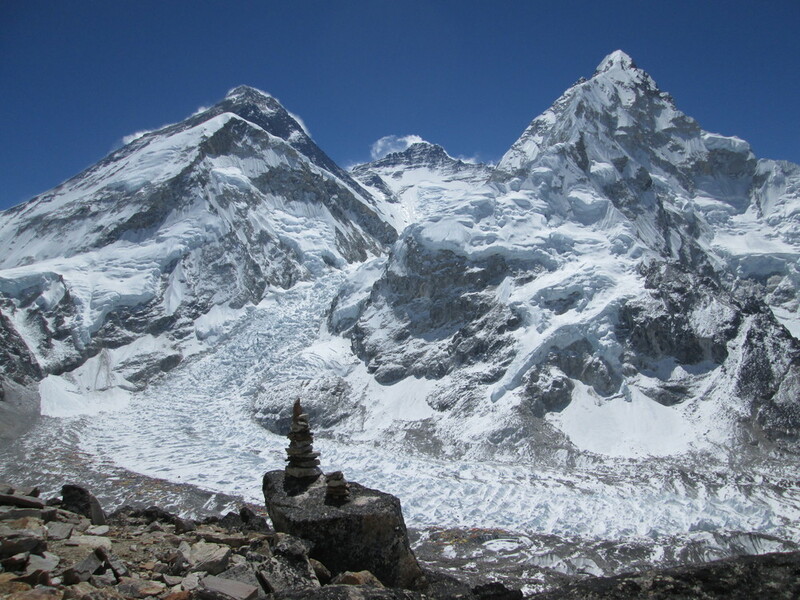 Located on the NW edge of the Khumbu Glacier, Everest base camp is a series of camps stretching out about half a mile. In the picture below of Everest, Lhotse and Nuptse, base camp is on the outside ridge of the curving glacier at the base of the icefall. Camps generally draw water from the west side of the moraine and use the east side of the moraine as the path for accessing other camps and the Khumbu icefall, which leads up into the Western Cwm that separates Everest from Nuptse. IMG’s camp is fantastic. 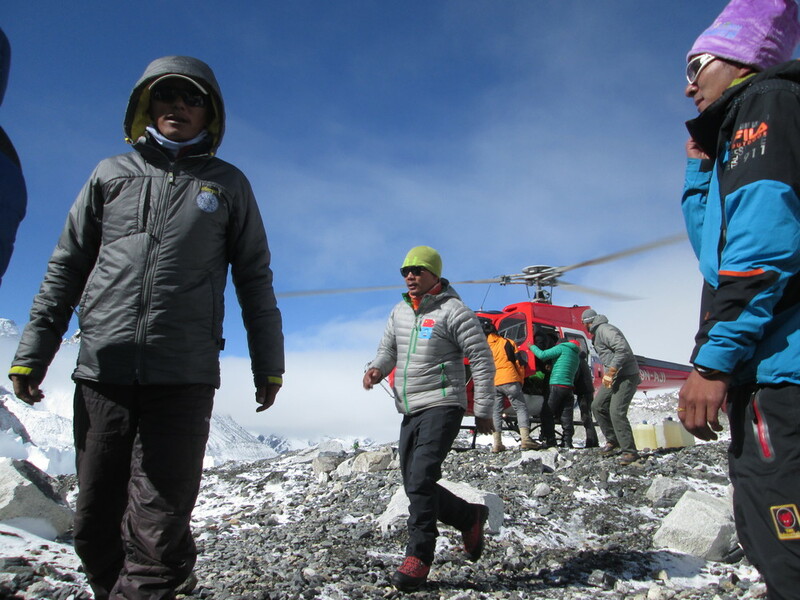 Our summit team includes ~24 climbers, 8 guides, and about 50 Sherpa guides, porters, cooks and camp managers. Our tents occupy the high ground along the ridges of the moraine and at the center we have dining tents, a common tent with internet and electricity, and a large Buddhist altar for pujas and prayer flags. We spent two nights taking in base camp before hiking back down the valley to Lobuche Peak (20,128’), which we ascended to within a couple hundred feet of the true summit to help us acclimatize. The views from the summit ridge were incredible—we could see four 8,000m peaks (Cho Oyu, Everest, Lhotse and Makalu) as well as the shorter but equally famous peak Ama Dablam. By the time we got back to Everest base camp two days ago, we were beginning to feel much more comfortable living at these high altitudes. 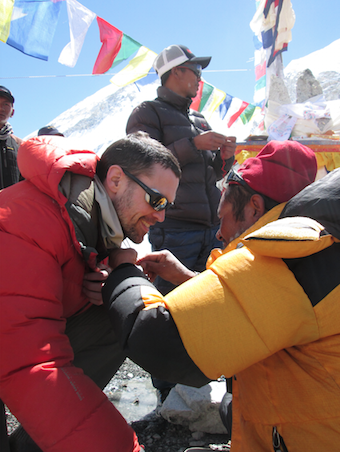 Yesterday, our expedition had a large puja blessing ceremony at base camp, during which we each received a sundi necklace for good luck during our climb. The ceremony was similar to the one we attended with Lama Geshi, but longer, larger and more involved. What struck me most was how genuinely happy all the Sherpa seemed to be during the ceremony. The part where we each got flour painted on our faces to symbolize our hope that we may all live long enough to grow a white beard quickly turned into a game of tag, with Sherpas delighting in smearing the flour quickly and profusely on those who least expected it. And the traditional Sherpa dance at the end of the ceremony lasted almost 45 minutes, as more and more Sherpas suggested additional songs and even invited westerners to sing and dance alongside top 40 music blaring from two small portable speakers. I left the puja with the realization that joy is a choice—it is a state of mind that we can embrace and accept where and how we want. Our Sherpas very much chose for the puja to be a joyous, fun occasion, and their energy infected all of us. I hope that as I climb the mountain and eventually return to the States, that I too will be able to choose joy and contentment as easily and regularly as our teammates do here. Over the next three weeks, we will be moving up and down Mt. Everest in rotations—climbing and sleeping higher on each rotation than we did on the previous one. Between rotations, we will rest and recover at base camp, and on our third rotation we will attempt the summit. The mountain looms over 2 vertical miles above us right now, but by focusing on health, nutrition, and taking one small step at a time, I think we will make the most of this opportunity. I reflect regularly on the lessons I’ve learned from so many of you, and climbing, joking and becoming acquainted with the Sherpa make me continually proud to be taking this mountain on as a way to advance intercultural exchange for teenagers. That is also very true of the aid efforts for the Sherpas and Nepal in general. For anyone who wishes to contribute to the Sherpas, Support For Sherpas, a British group, seems to be responding to that specific need, while Mercy Corps and Global Giving, both American groups, have opened efforts for all of Nepal. I’m sure there are others, but these were some I could find on short notice. All three have easy-to-navigate donation methods. "Thanks for Andrew's update. I reread the article in The Light and thought I'd correct a minor error. Andrew's FIRST summit was Mount Mansfield, Vermont's highest peak, at the age of 6 in 1988, just before we left Vermont for North Dakota. He is at the left in the picture. His brother Jonathan, 8, is on the right."